Skipping Workshops was delighted to support this summer’s ‘Get Fit for Fun’ event at Bisham Abbey National Sports Centre, organised by TotallyTween, an online magazine for pre-teens. 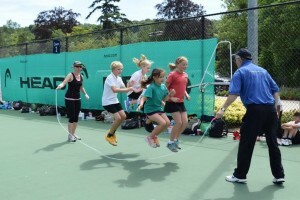 The event, attended by children from the Windsor and Maidenhead area, was a celebration of skipping as a healthy and fun form of activity. Skipping Workshops Head Coach, Harold Galley, led the skipping workshop and double dutch training sessions, before Tiffany Branscombe from ‘the Bouncers’ skipping display team demonstrated some advanced skipping skills that the children can work up to. The children were fascinated to see how they could develop their skipping skills. Skipping Workshops was happy to donate £500 worth of ropes and training to the event, making sure that every child who took part was able to take home one of our extremely popular ‘Solar’ Skipping Ropes.